I recently received a question regarding the life of Corporal Lucian Thomas Libby of Scarborough. 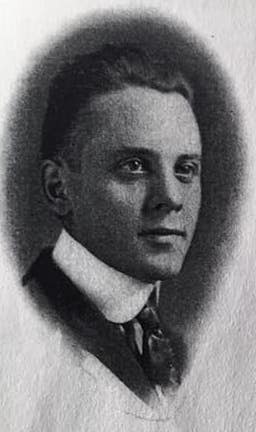 Lucian died of wounds during World War I. His questions were, do we know which battle he died in and if there are relatives in the area? My “go-to” place for his first question is Family Search. There, I was able to quickly find the Grave Card for Lucien T. Libby[i]. It indicated that he is buried in Black Point Cemetery, in section A, and that he died on 22 October 1918 in Souilly, France. Souilly was the headquarters for General Pershing during the Meuse-Argonne Offensive. Lucien served with the 13th Company, Coast Artillery, Maine National Guard (Battery F, 103d Field Artillery Unit). The Meuse-Argonne Offensive was, according to Wikipedia, the largest and bloodiest operation of World War I. The offensive, also known as the Hundred Days Offensive, brought the war to an end. 26,277 American lives were lost. Corporal Libby was wounded on 11 October 1918, exactly one month before the end of the war. The 24-year-old lived 11 days before succumbing to his injuries. Lucien was born in Scarborough the son of Charles E. and Sarah F. Libby. Both the 1900[iii] and 1910[iv] Censuses indicate that Lucien had two siblings, George and Lena. Charles Libby set up a fund at the Scarborough Public Library to purchase books which exists to this day. Lucien Taylor Libby is remembered through the American Legion’s Libby-Mitchell Post #76 in Scarborough, whose name honors him and World War II casualty Donald Mitchell. I will remember Lucien, and his ultimate sacrifice, which helped bring an end to the Great War. And yes, there are descendants of Charles Libby living today. 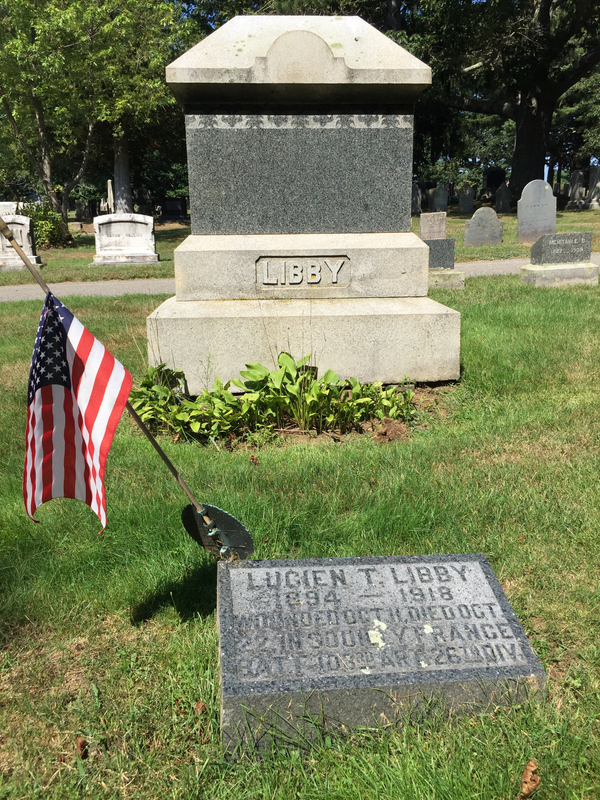 database, FamilySearch (https://familysearch.org/ark:/61903/1:1:QP4Y-VXW – accessed 30 October 2018), Lucien T Libby, ; citing Burial, Scarborough, Cumberland, Maine, United States,; Maine State Archives, Augusta. [ii] “United States World War I Draft Registration Cards, 1917-1918,” database with images, FamilySearch (https://familysearch.org/ark:/61903/1:1:KZFR-9ZM – 13 March 2018), Lucian Taylor Libby, 1917-1918; citing Cumberland County no 2, Maine, United States, NARA microfilm publication M1509 (Washington D.C.: National Archives and Records Administration, n.d.); FHL microfilm 1,653,905. [iii] “United States Census, 1900,” database with images, FamilySearch (https://familysearch.org/ark:/61903/1:1:MMLF-NR9 – accessed 28 November 2018), Charles E Libby, Scarborough town, Cumberland, Maine, United States; citing enumeration district (ED) 78, sheet 14B, family 346, NARA microfilm publication T623 (Washington, D.C.: National Archives and Records Administration, 1972. ); FHL microfilm 1,240,591. [iv] “United States Census, 1910,” database with images, FamilySearch (https://familysearch.org/ark:/61903/1:1:MR3M-Z4P – accessed 28 November 2018), Charles E Libby, Scarboro, Cumberland, Maine, United States; citing enumeration district (ED) ED 101, sheet 16A, family 376, NARA microfilm publication T624 (Washington D.C.: National Archives and Records Administration, 1982), roll 538; FHL microfilm 1,374,551. This entry was posted in They Answered the Call. Bookmark the permalink.